It took two attempts for us actually get a table at Bubbledogs. The first time, a Thursday night, we arrived at 6.05pm and were told that it would be a 4 hour wait. This time we arrived at midday and it was practically empty. However, that didn’t stop it taking over 20 minutes for the waiter to notice that we wanted to order. I loved the interior of Bubbledogs – exposed brickwork and soft lightening. The drinks menu consists almost entirely of champagne and it ischampagne, no cava or prosecco in site and the price tag matches with bottles starting at £36. We order a glass of the Guy Charlemagne, Blanc de Blanc, Grand Cru, Brut which set us back £8 each. The champagne was really crisp and fresh however, our waiter didn’t really seen to know the differences between the different types so it really was a guess. 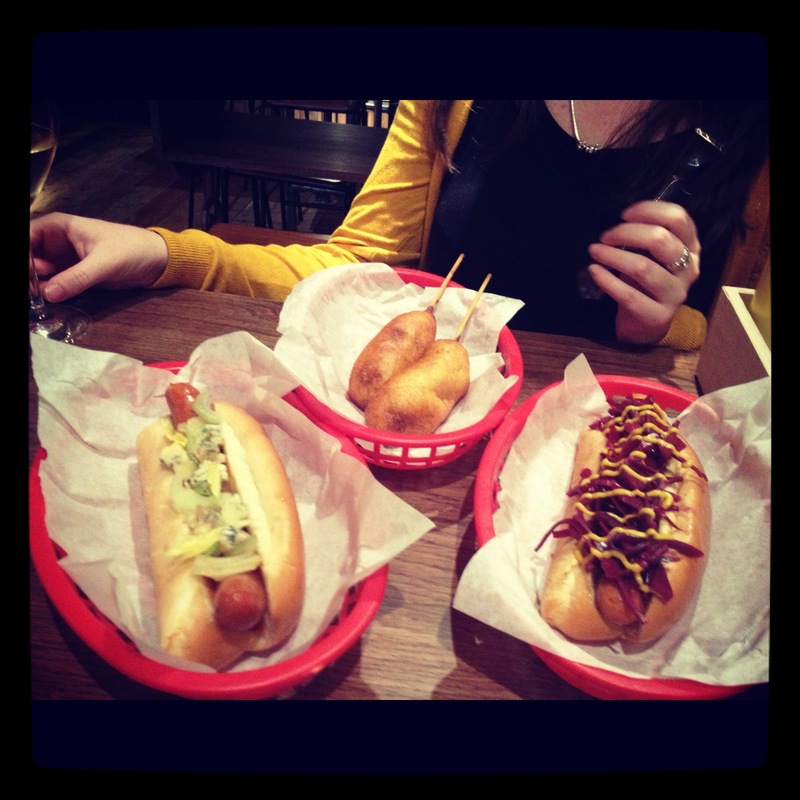 When it came to the hot dogs, we order three dogs between two of us (and a side of sweet potato fries). We thought we were bring piggys but it worked out to be a perfect amount. They hand-make the hot dogs in house and they were fresh but I found them a little bit oily for my taste and it made the soft brioche-style bread start to fall apart. First up was the “Red Rocket” with pork sausage. It was delicious with crunchy red cabbage offset by the hot mustard and juicy pork sausage. 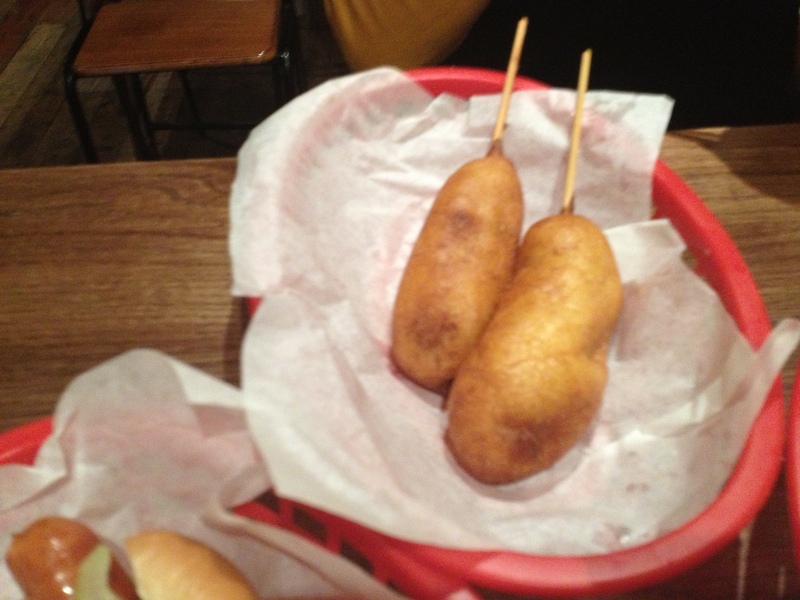 Next up was the corn dogs, a personal favourite of mine from when I was a kid, and these were definitely better. The batter was light and crispy however, there wasn’t any corn bits as advertised on the menu (we all know how much I love sweet corn.) 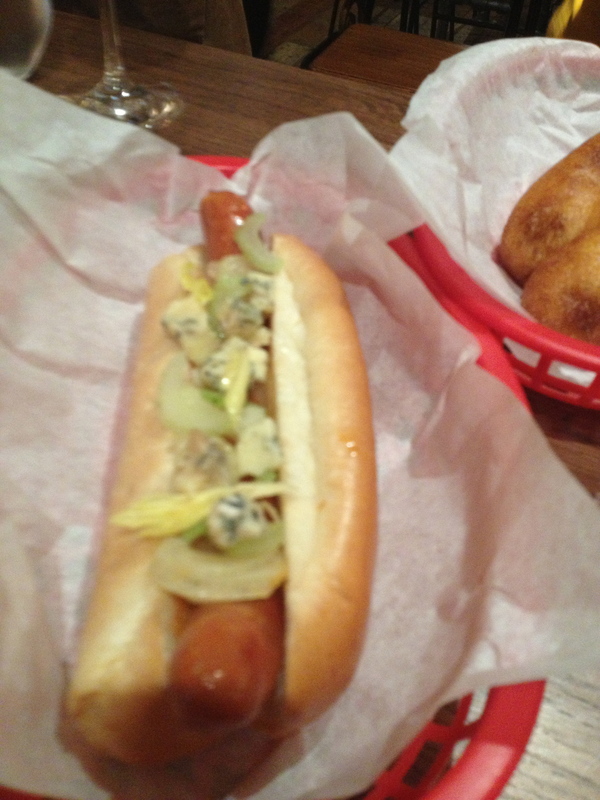 Finally, the buffalo dog came with blue cheese and celery. While it was quite good, the buffalo sauce completely over-powered the blue cheese. All in all, I found Bubbledogs confusing as a restaurant and maybe that’s why I, while I wouldn’t say I didn’t like it, I wasn’t convinced by it. If Bubbledogs was treated like a bar – remove the seats, waiting lists and waiters – and packed the place out like a champagne bar that served hot dogs as a cheeky aside then this place would work immensely well. Or, treat it like a proper restaurant – with comfortable seats (not the school like wooden chairs), slightly bigger portion sizes and some focus on a dining expierence – then it would also be a fun restaurant. But, Bubbledogs as it stands, is too arrogant for me.